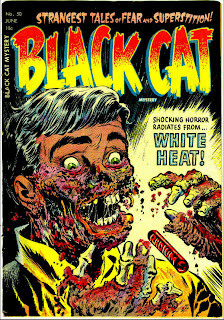 Lee Elias died in 1998 at age 78, and left a lifetime's worth of very fine work behind him in the comics field. 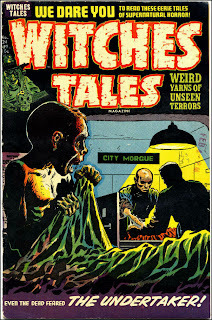 He drew in several genres of comic art, but my favorites were his science fiction and horror. In the early '60s I liked his work on DC Comics' Showcase issues of Tommy Tomorrow. 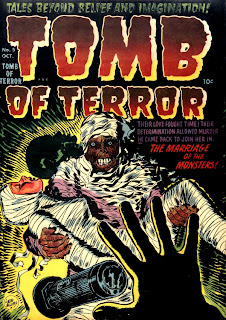 I have read that Elias doubled as art director for Harvey Comics, specifically on their horror comics. The contents of the comics didn't always match the exteriors, but even without the contents, the comics are worth having just for the covers. I'm sure these comics got lots of attention when they came out, both from readers and alarmed parents. Monsters, mutilation, skeletons! Living dead! Yow! 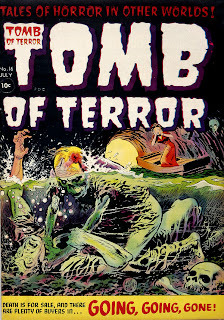 In my opinion from looking at hundreds of covers of horror comics over the past couple of years, the best artists were Jack Davis* of EC Comics, Bernard Baily,* of Fawcett and other publishers, and Lee Elias of Harvey Comics. 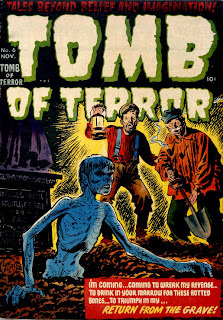 Not only were they all great comic book artists, they were artists with a lovingly natural bent (and I do mean bent) for the gruesome and grotesque . 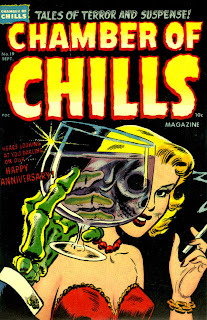 From Pappy's #38, some of my favorite Davis horror covers. From Pappy's #34 and Pappy's #31, some classic Baily.